The first time I visited this site was during the winter, the ground was so boggy and soft it was impossible to reach the circles, all I could see was the top of one stone sticking up through the marsh. 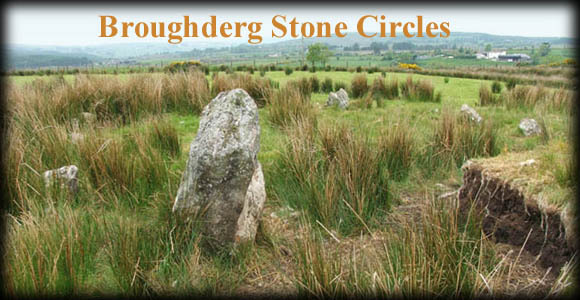 On my recent visit I was able to approach the circle but to my surprise there are two contiguous circles with a small cairn and standing stone set between them at the north west. 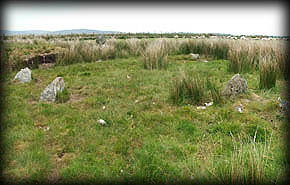 The north circle is comprised of ten stones and the southern circle has fourteen stones remaining. 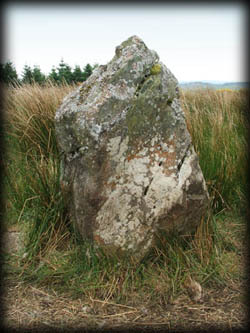 The standing stone, pictured left is approximately 1.5 metres high by 0.75 metres wide and the cairn is about 3 metres across. Situated: From Beaghmore head south and at the first junction turn sharp right, at the next T junction take a right, after about 2 1/2 kilometres there is a right turn for Crouck, just passed this turn is a gate on your right, park here the circles are in this field approx 50 metres from the gate. Discoverer Map 13: H 6525 8438. Last visit June 2006.